Project aims to control lights and CO2 admission to a planted aquarium. User has 2 lights time interval to set and one CO2 time interval. In the defined time intervals relays that control lights and CO2 are turned on or off. Additional sensors were added to read data about the aquarium and room. So far so good. The interesting part of the project is still to come: the time intervals, relay controls and sensors data are driven and stored by a PC running Linux and NodeJS server. The server stores sensor data in a database and exposes a web interface for users to setup time intervals and see historical sensor data in chart format. 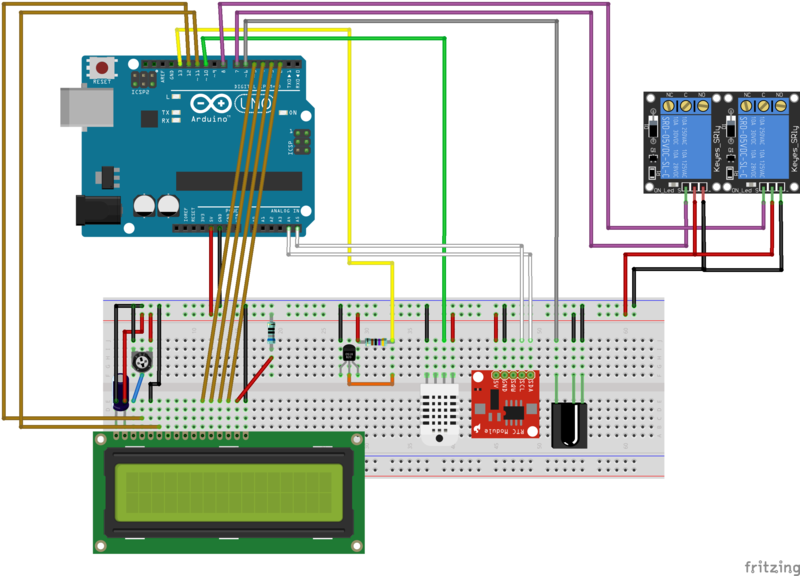 Communication between NodeJS server and Arduino is done using serial port. Web application requires authentication in order to gain access to controls and sensor data. Details on how to install and run NodeJS server can be found on GIThub. PS: This is my second project using Arduino, so any advice would help me a lot. Sensor data is updated every 20 mins. (time interval value can be easily adjusted) and the updated data is displayed on the LCD and sent to server via serial port. Server is storing the data in a database (mongo DB) in order to be used as statistical data in web interface. Project uses Time and TimeAlarms Arduino libraries to manage time and schedule events that control relays. Schedulers are also used to periodically read sensor data and send data to server. RTC module is used to keep track of time in case of a power failure. Time library syncs with RTC module based on a schedule. The server for this setup is is using NodeJS, Express and MongoDB and is capable of communicating with Arduino through serial port. The server also exposes some APIs endpoints that are used to communicate with the web interface. Aquarium Controls: control the 2 relays directly from web interface (manual mode on light and CO2). Displays the total amount of time when lights and CO2 are on. Statistics: sensor data displayed using charts. Charts can displayed data from current day, last week or last month. Old PC or laptop. In this setup i used and oldish MSI mini PC Celeron 1.8Ghz, 2GB DDRAM3, 256GB HDD. This is usually used when developing the server and web-interface. setup up a web-server that servers the generated Angular web-app (static files : html / css / js / images / fonts). I recommend using NGINX for this. I would be happy to share more details on this. Just let me know.